Win Driver Backup is a professional driver backup utility that can backup all device drivers in computer so that you won't need to find old driver CDs or search online to find the driver that matches you device one by one. When you need to restore them due to system crash, reinstall or other unpredictable accidents, just a few clicks can get them back from your harddrive. The neat UI and straight design enables you to effortlessly create backups of devices as well as cookies, favorites and registry for rainy day. Drivers can't be more important for a computer. 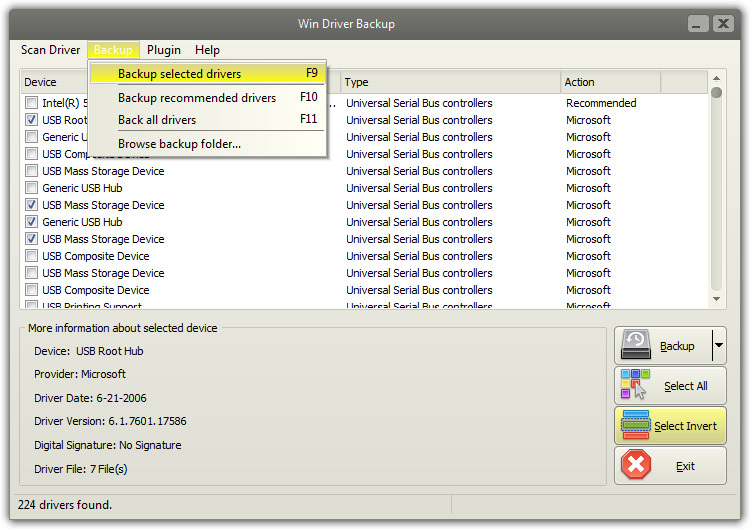 Win Driver Backup is a specialized driver backup tool with ability to backup all the major system drivers on your computer like audio drivers, video drivers, network drivers, etc. so that you won't encounter any trouble when facing computer crashes or other disasters. You can put as much emphasis on drivers - the soul of hardware components. It can be awful with drivers missing or unusable. The free driver backup tool backs up all your specified drivers and saves them into well organized folders and when you want to restore them, you can easily find the one you need. Now, you can rest assured that any problems regarding driver restoration can be conquered. You must have been tired of digging through stuffed drawers or store cabinet for old install CDs as well as doing reluctant surfing for compatible drivers every time you find computer out of gear. Our free driver backup can free you from the aforesaid annoyances with ability to create backup of all the drivers. Driver Updater Platinum - Driver Updater's device identification engine automatically determines the exact components and peripherals installed on your PC or laptop and quickly pings our Smart Update software location system for available updates. Windows 7/8/10 supported. DriveTheLife - DriveTheLife is a straightforward and totally free Windows application designed to download and install driver updates, repair driver issues, backup and restore drivers with ease, uninstall/remove unwanted hardware drivers for Windows users.